Need more information about booking Home 7511833 ? 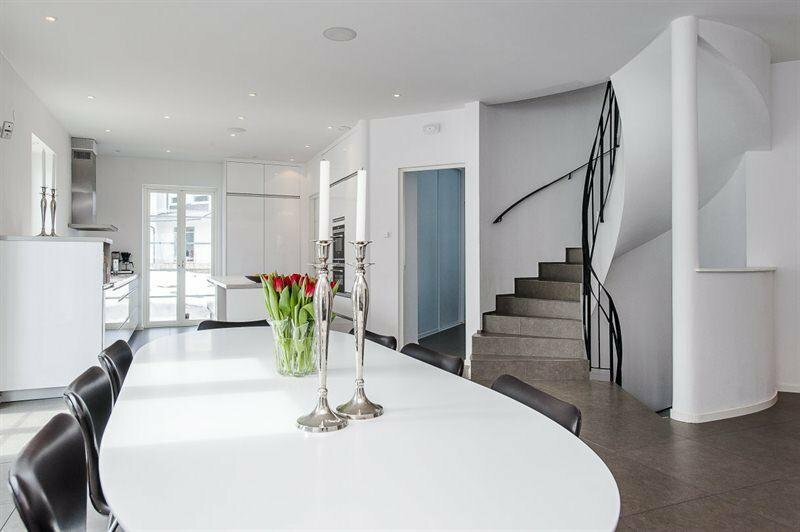 A chance to experience living in a Pål Ross architect designed home with lots of space, a huge secluded garden with heated pool and spectacular sea views. Situated on the tranquil island of Resarö, accessible by car and only 5 minutes from the Famous Vaxholm, or 25min to the heart of Stockholm city center. Enjoy the the midnight sunshine or a trip on a steam boat from Vaxholm. What ever your preference there is plenty of choice, outdoor activities are plentiful. The best way to see the island is from the water, you can rent a kayak or canoe from the local canoe club 2.5 km away. There is a regular bus service that takes you straight into the city and the trip takes roughly 45 min, or one can take the ferry from either Resarö or the near by Vaxholm, the boat stops outside the Grand hotel central Stockholm, the trip takes on hour. Cycling is also a popular way of getting around, you can take the bikes on the ferries if you wish to do some island hopping. More often than not we are here to welcome you and answer any eventual questions. You can get in touch with Shayne (the owner) through the contact form on this page. Send Shayne (the owner) an email through the contact form on this page. Alternatively, if there’s a phone number on this page, you can call them. How do I contact Shayne (the owner)? If you’ve already booked, go to Manage your holiday booking to view Shayne the owner's contact details or send them a message. Or send Shayne (the owner) an enquiry through the Contact the owner/manager form if you’d like a quote or more info first. When you pay online through the Book your stay form, a booking request is sent to Shayne (the owner). You’ll find out within 24 hours whether they’ve accepted - no money will leave your account before then. You can also request a quote from Shayne (the owner) through the contact form. The owner will email you the total cost for your dates and a link to book and pay online. Use the Book your stay form to pay provisionally online. You can pay by credit/debit card or PayPal. Shayne (the owner) will have 24 hours to accept the booking and no money will leave your account before then. Why can't I call Shayne (the owner) before booking? You’ll need to contact Shayne (the owner) to do this. Send them a message in Manage your holiday booking or through the contact form on this page. You can request to change the dates or number of people on your booking via the Manage your holiday booking page. To change your holiday dates use the Edit booking button. If you need to change the number of guests staying then send Shayne (the owner) a message. If Shayne (the owner) agrees, they’ll send you a revised quote outlining the changes. You can review and accept/decline this from the Manage your holiday booking page. You’ll have 48 hours to take action before the revised quote expires. Estimated price per night based on a weekly stay. Owner fees of $377.00 per stay may apply. Enter your dates to see the total cost.